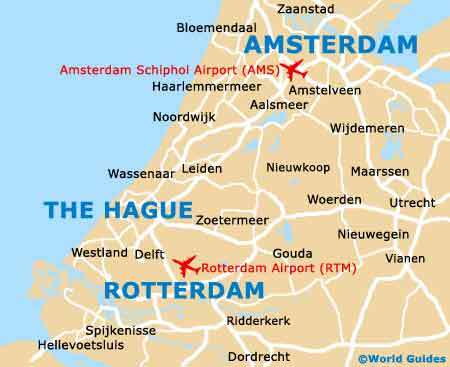 Behind both Amsterdam and Rotterdam, The Hague (Den Haag) is currently Holland's third-biggest city and better known to the Dutch as either Den Haag or 's-Gravenhage, (The Count's Domain). Once the Dutch capital some 200 years ago, The Hague remains an important and vibrant city with a rather refined appearance, boasting many stately mansions, grand embassy buildings and tree-lined boulevards. The Hague is both a historic and modern city, with a wealth of art galleries and a truly world-class jazz festival, the North Sea Jazz Festival. This major event takes place each year in July at Den Haag's buzzing seaside resort of Scheveningen, some 4 km / 2.5 miles to the north-west of the city centre. For tourism advice, check out The Hague Tourist Information Office on the Koningin Julianaplein, or in the Palace Promenade Shopping Centre at Scheveningen. Den Haag's scattering of districts each have something to offer to tourists. 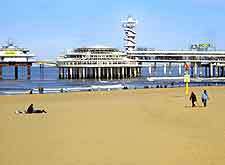 Scheveningen is filled with interesting attractions, such as its long pier, miniature buildings at Madurodam, and Panorama Mesdag, a historical cylindrical painting measuring more than 100 metres / 328 feet. Family hotels close to Scheveningen Beach are particularly desirable, as are The Hague apartments, particularly when they come with views of the North Sea coastline. Dutch politics have long been based in The Hague and centred around the parliamentary buildings surrounding the Binnenhof, while the country's royal family are often in residence at the Noordeinde Palace. Another notable landmark in The Hague is the Peace Palace (Vredespaleis), which today houses the UN International Court of Justice. 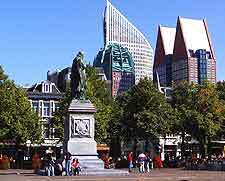 More information about The Hague Tourist Attractions and Landmarks. The small but perfectly formed Mauritshuis Museum is amongst the best of the cultural attractions within The Hague and is where you will find an extensive collection of both Flemish and Dutch masterpieces. Art exhibitions are also hosted at the Gemeentemuseum (Municipal Museum) and at the 18th-century Paleis Museum, an elegant building once the home of Queen Emma. Something perhaps more suitable for the younger visitors to The Hague is the interactive science centre named simply the Museon, although the historical information at the Prison Gate Museum (Gevangenpoort) is often surprisingly appealing as well. 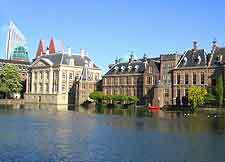 More information about The Hague Museums and Art Galleries. The Hague is extremely well placed in the Netherlands and very close to a number of leading Dutch city's, such as both Amsterdam and Rotterdam. Famed for its blue and white Delft pottery, the pretty town of Delft is also nearby and features meandering canals, period architecture and bustling markets. Many Den Haag tourists also enjoy a day trip to Gouda, home of the tasty Gouda cheese and a rather beautiful market square, presided over by the St. Janskerk Church. 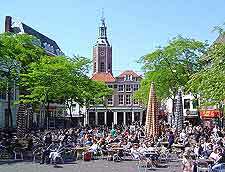 More information about The Hague Attractions Nearby.